Eagle Ford water use has grown significantly over the past few years as activity increased in South Texas. Eagle Ford drilling has grown to more than 200 rigs working around the clock. That's from virtually zero in early 2009. Drilling and completing wells uses millions of gallons of water and combined with a drought it has bred public concern. The voices of concern are being heard and even the Eagle Ford Task Force has water on its agenda. We'll likely hear from the group about best practices in South Texas in early 2012. The usage reported by Chesapeake was commonplace early in the development of the play, but the drought and cost of water has motivated companies to rein in their use. ConocoPhillips has brought water usage in each well down to 85,000 barrels or less (3.57 million gallons) in 2011. That's a 30% drop in consumption per well and we haven't quite hit full stride in development of the play. Conoco also estimates that at its peak the Eagle Ford will account for 5-7% of total water consumption across the 16 county area studied. We can also expect usage to drop further after leases are held by production and the play is fully delineated. In full development mode, companies will leverage economies of scale to drive down costs and preserve resources. The recycling of frack flow back is one way the industry will tackle water issues. Recycling saves the need for disposal of produced fluids. Disposal wells are common in Texas, but the drought might increase the need for additional conservation measures. Recycling is used minimally in South Texas, but is employed on a wider scale in other parts of the country where disposal isn't adequate or fresh water is even more scarce. The Texas Water Resources Planning Division of the Commission is directed by legislation passed in 1957 (Texas Water and Planning Act of 1957). The division is set out to prepare and submit to the legislature a state-wide report of the water resources of Texas with a correlation of the relationship of these resources and to make recommendations to the Legislature for maximum development of water resources. In 1997, Texas passed legislation that outlines a water planning process to help ensure the water needs of all Texans can be met. One piece of the legislation calls for Regional Water Planning Groups (RWPGs). The water planning groups are tasked with determining future demand and supply under drought conditions. The groups also lay out risks of not meeting water needs and propose regulatory, administrative, and legislative changes to improve water resource management. All that to say, the RWPG's are responsible for estimating oil and gas industry use and will be tasked with planning for and, if needed, proposing legislative changes to help ensure adequate supply is available during and after oil & gas development. A water Well authorized under a permit issued by the RRC of Texas under Chapter 134, Natural Resources Code, or for production from such a Well to the extent that Withdrawals are required for mining activities regardless of any subsequent use of water. The Texas Commission on Environmental Quality (TCEQ) is responsible for the administration of water rights in Texas. In South Texas, Watermasters programs that are directed by the TCEQ are responsible for water management on the surface. "The TCEQ’s watermaster programs ensure compliance with water rights by monitoring stream flows, reservoir levels, and water use. The watermaster regulates reservoirs as needed to prevent the wasting of water or its use in quantities beyond a user's right. Before diverting, a water-right holder must notify the watermaster of the intent to divert at a specific time and the specific amount of water. Assuming that the water is available and that the water-right holder has not exceeded, or will not exceed, the annual authorized appropriation of water, the watermaster then authorizes the diversion and records this against the right. The two watermaster programs include staff “deputies” who daily, weekly, or monthly make field inspections of authorized diversions to insure compliance with the water right (e.g., that the diversion rate is not exceeded). If a water-right holder does not comply with his or her water right or the rules of the Commission, the executive director may direct the watermaster to adjust the control works to prevent the owner from diverting, taking, storing, or distributing water until he or she complies. As provided by the Texas Water Code, the TCEQ collects fees from all water right holders within the watermaster’s jurisdiction in order to pay for the expenses of the watermaster’s operations and duties. An account is maintained for each water-right owner based on each type of authorized use under the water right. The total assessment per account comprises two fees: a base fee charged on each account and a use fee charged on the total number of acre-feet of water the owner is authorized to divert per year for each authorized use. The current base fee is $50 per account and generally does not change from year to year. The use fee is calculated each year and is based on the proposed operating budget for each watermaster program." 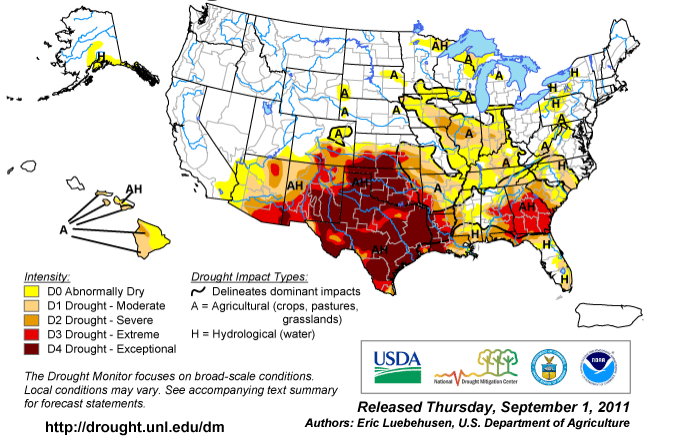 We're in the midst of an "Exceptional" drought in Texas and you can bet we'll debate water use as long as this drought persist.